Looking for a stylish way to improve drainage and reduce soil erosion for your North Arlington area home? O’Grady’s Landscape has just the solution! We build retaining walls for homeowners throughout North Arlington, Virginia designed to protect their properties, while adding to the aesthetic of the overall landscape. We have been providing retaining wall design and installation services to clients in North Arlington, VA since 1991 and are ready to put our experience to work for you. Don’t wait for drainage issues to destroy your lawn and plantings—call us at (703) 533-5001 to schedule an appointment today! As your one-stop-shop for landscaping in North Arlington, O’Grady’s Landscape has all your needs covered. We will help you find the best materials, designs, and location for your new retaining wall to ensure it’s perfectly tailored to work with your landscape. Looking for help with master planning to improve drainage, as well as the overall functionality and appearance of your landscape? We can help with that too! Check out our landscape design and hardscape services to see how we can improve the look and feel of your property or give us a call to receive personalized recommendations from our highly trained, experienced North Arlington, VA landscapers. 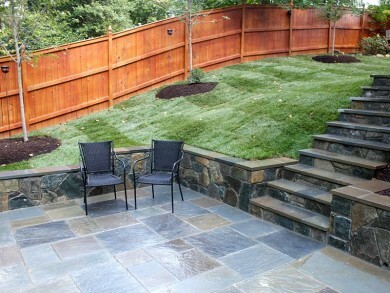 From simple to extravagant, the specialists at O’Grady’s Landscape can help you accomplish all your landscaping dreams and keep your favorite hardscapes protected from any storm with our North Arlington, VA retaining wall services. If you’re having flooding issues in your yard, it’s important to install a more effective drainage system in order to keep your property and belongings protected. Improper drainage and water runoff can damage your hardscapes, lawn, and plants. We can help you create the best retaining wall design to combat these issues and keep your outdoor living spaces in tact no matter what. To see how you can benefit from retaining wall installation in your North Arlington, VA home, contact us for a consultation. Call (703) 533-5001 to get your FREE estimate today!